crisp and lemony to viscous, creamy and nutty. 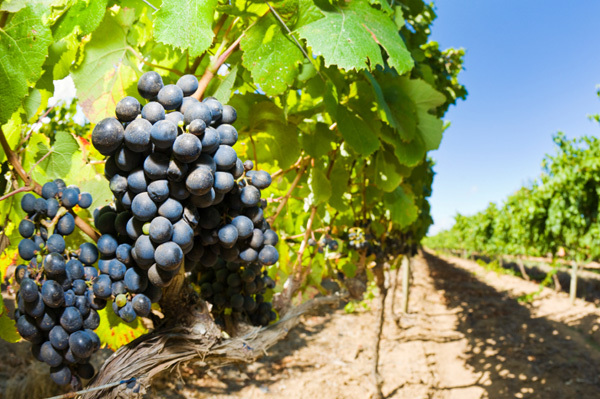 Learn more about wine grape varieties in this article from New Orleans Gourmet! There are a number of factors that, blended together, determine a wines particular flavor profile, namely grape variety, “terroir” (soil and climate), winemaking techniques, the vines age, weather conditions, viticultural methods and the wines maturity level. Most wine lovers, however, tend to gravitate toward a particular grape type and typically make their wine choices based initially on that determining factor. Naturally the wine brand, vintage, food with which it will be consumed, occasion, cost and a list of other factors will come into play when selecting the prefect wine. While there are more than 1,000 grape varieties used in winemaking (most of which are considered “blending grapes”) there are a handful of red and white varietals that are considered principle. Chardonnay is a classic white wine grape best known for the wines produced in Burgundy, France. Widely planted throughout the world today, and becoming increasing popular in California and Australia in particular, Chardonnay wines can range from clean and crisp with a hint of apples, figs and tropical fruit flavors to a rich, creamy style wine with complex, oak-aged buttery aromas. The most noble grape in the world for dry white wine, Chardonnay is responsible for all of the great white Burgundies — Meursault, Montrachet, Pouilly-Fuisse and Chablis. It is one of the grapes used in Brut Champagne and the only grape used to make Blanc de Blancs Champagne. Chardonnay wines can have exceptional aging potential. Sauvignon Blanc is a white wine grape with many styles. Used often as a blend with Semillion in the Bordeaux region, they produce light, crisp, dry wines which are noted for high acidity and grassy, herbaceous aromas. In the Loire Valley the grape is used exclusively to produce the wines of Sancerre and Pouilly Fume where their signature is the unforgettable aroma of cat pong and a crisp, smoky style. Also known as Fume Blanc in California, these wines are often vinified in oak offering a softer, fuller style than its French counterpart. Riesling, the classic white grape varietal of Germany, is capable of producing wine with an extraordinary balance of sweetness and acidity. The wines are characterized by a flowery, fragrant aroma and distinctive fruity acidity. Riesling can be dry, or it can produce some of the world’s greatest naturally sweet wines with apricot and peach aromas and rich, honeyed, nectar-like flavors. These dessert wines, which are the result of late harvesting and botrytis, are labeled as Auslese, Beerenausles and Trockenbeerenauslese depending upon sweetness level. Gewurztraminer is a highly aromatic grape that yields spicy, flavorful wine with hints of orange zest and strong floral aromas such as those of dried rose petals. Most often the wine is lively, fresh and dry, however, it can also produce off-dry, sweet and very sweet dessert wines. An important grape in France’s Alsace region, Gewurztraminer is also grown in Germany, California and Washington State. Semillon is a white grape variety most commonly knows for its blending capabilities. Used in France with Sauvignon Blanc for the white wines of Bordeaux, Semillon offers softness, roundness, low acidity and an aroma described as lemony and lanolin-like. Today, it is grown in California, Washington State and Australia and is often blended with Chardonnay to make a softer, lighter style wine. It has become known as a flexible variety with a special affinity with oak and is now becoming popular as a single varietal wine. Chenin Blanc is best known for its production of Vouvray and sparkling wines of the Loire Valley. A grape capable of making wines that range from bone dry to very sweet, Chenin Blanc retains a well-defined fruitiness, often suggestive of pear and apple. Chenin Blanc, which is widely grown in California where it tends to be best at an early age, possesses a high degree of acidity that lends a pleasant crispness to its wines. Pinot Blanc makes an elegant white wine with aromas of apples and melon and a clean, delicate finish. Grown mainly in Alsace, France, Pinot Blanc is closely related in taste and aroma to Chardonnay, although subtler and slightly more tart. The grape is known as Pinot Bianco in Italy and as Weissburgunder in Germany and Austria. In California and Australia the wine is often vinified in oak barrels creating a fatter, more lush style of wine. Pinot Blanc is often described as a “cousin” to Chardonnay, but it is in fact a clone derived from the red grape, Pinot Noir. Pinot Gris is the grape varietal found in Alsace, France where it is also known as Tokay d’Alsace. The grape is known as Pinot Grigio in Italy, Rulander in Germany, Pinot Beurot in Burgundy, etc. The style of wine produced from Pinot Gris can vary from robust, mouth filling and dense to light, crisp and dry. Oak is an option of the winemaker and is often used in Alsace and Italy. Muscadet is best known as a perfect match with fresh raw oysters. It is also known as Melon de Bourgogne where it is native to the Loire Valley. This grape produces a fresh, light, delicate white wine accented by floral aromas and a subtle citrus flavor. Muscadet is best drunk when young. Trebbiano is the principle white grape varietal of Italy, mainly grown in the Tuscany region. It is used in the making of Soave, Orvieto and Frascati, and is generally blended with one or more grape varietals. The main characteristic of Trebbiano, also called Ugni Blanc in France, is its high yield. The wine produced is generally light, in color and in body, with high acid and medium alcohol. Cabernet Sauvignon is considered by many to be the best grape variety in the world. It is the easiest to grow and harvest and adapts admirably to different environments. This late ripening grape produces wines that are tannic, astringent and highly colored with complex aromas of black currants, cedar, mint and leather. This superb and noble grape is largely responsible for the great clarets of Bordeaux, particularly those of the Medoc and Graves areas. Cabernet Sauvignon wines can have incredible aging potential. Cabernet Franc is a late ripening variety, budding just before the Cabernet Sauvignon. Its wines are less tannic, are very aromatic (violet, raspberry, black currant and licorice) and are more refined. It is almost always blended, often with Cabernet Sauvignon and is often used in wine of the Bordeaux region. Merlot is a grape that produces not deep but nicely colored wines, soft in fruit, but capable of great richness. A distinguished grape of Bordeaux, Merlot is often blended with Cabernet Sauvignon in the Medoc and Graves regions to give softness, grace and a velvety texture to the more austere Cabernet. In other parts of Bordeaux, namely Pomerol and St. Emilion, Merlot is the principle grape producing a rich and silky wine. Due in part to its soft, supple nature, Merlot has become increasingly popular as California, Chile, Australia and Italy have all increased planting of this popular grape. Single varietal Merlot wines are soft, fruity, fragrant and should be drunk fairly young. Pinot Noir, a very old traditional grape of Burgundy, produces rich, delicate, velvet-smooth wines with great finesse. Pinot wines are usually more acidic that those of Cabernet Sauvignon, but less tannic. This delicate varietal yields wines that are rich ruby in color with aromas of the red soft fruits, violets, peppermint or truffles. Pinot Noir is responsible for the glorious wines of Cote d’Or, Corton, Volnay and Pommard among others. It is also a leading grape of the region of Champagne. Pinot Noir wines have a vast aging potential, yet can still be enjoyed at young age. Mourvedre is an excellent quality grape variety that is grown extensively throughout the Rhone Valley and under the name of Mataro in Spain. Mourvedre wine is usually highly colored, well constructed and very tannic, with a spicy bouquet that has a hint of violets. This varietal is often blended with Grenache and adds to the wine superb color, structure and complexity. Gamay, the famous grape of Beaujolais, is early ripening and suitable for planting practically anywhere. Good Gamay wines are light, fresh, emit a pleasant bouquet and are best when consumed young. Beaujolais Nouveau, the celebrated wine that has become synonymous with Thanksgiving, has helped to make Gamay a more popular and stylish grape variety. Zinfandel, California’s most widely planted grape, is a very late ripening varietal. The Zinfandel grape produces highly colored wines with spicy, black pepper, raspberry and blackberry aromas. This fruity, adaptable grape can be gloriously lush, producing medium-bodied wines similar in style to Cabernet Sauvignon, and can age nicely. Most Zinfandel now goes into making a “blush” wine called White Zinfandel. Syrah produces wine that is strong in color and alcohol (11 to 13 percent), tannic and endowed with the bouquet of violets highlighted by cherry and black currants. This late ripening grape, which has been grown in the Rhone Valley for more than 1,000 years, is the exclusive grape of red Hermitage, the major grape of Cote Rotie and one of the grapes used in Chateauneuf du Pape. Today it is successfully cultivated in California, Australia (called Shiraz) and South Africa. Syrah wine is deep purple in color, peppery and black fruit in flavor, generally tannic, but which can mature to a big velvety, generous wine that is generally long-lived. Malbec Or Cot is a primary grape varietal in the Cohors region of France. This early ripening grape produces wine that is highly colored, dense and markedly tannic, however, the aroma is somewhat feeble. Often used in blending, Malbec is used in the making of rosï¿½s and uncomplicated reds. Grenache is Spanish in origin and is one of the principle varieties in the wines of Rioja. This late ripening grape requires much warmth and is used extensively in Australia and California, most often to make rosï¿½s. Grenache is also used in the Rhone and Southern France regions primarily as a blending grape. This variety produces fleshy, ripe wines that are high in alcohol and offer a deep fruity flavor, but lack in color. Carignan is the most common grape of France, where it occupies nearly 220,000 hectares of French soil. A late ripening varietal, it is dark in color, very harsh in its youth and is frequently bitter even when mature. For this reason, Carignan is seldom made as a single variety wine, but instead is used for blending often with Cinsault and Grenache. Mainly for blending purposes, Carignan is also widely planted in California. Cinsault is both a table grape and a wine grape. It hails from Southern France, but is being more widely cultivated elsewhere as growers come to appreciate its versatility. Cinsault lends finesse and softness, producing wines that are usually full-colored, low in tannin and quickly maturing with elegantly floral aromas. It makes an excellent complement to the great varietals, but should not be used on its own. Barbera is the most widely planted grape variety in the Peidmont region of Italy, accounting for 50 percent of the region’s reds. This soft grape produces medium-bodied, fresh, fruity wines that normally peak three to seven years after bottling. More California wine producers have begun cultivating Barbera because of the grape’s rich depth and mellow fruitiness. Nebbiolo is the noble grape of Peidmont’s greatest red wines. It is Nebbiolo that is responsible for the magnificently rich and smoky Barolo and the refined, slightly gentler, very elegant Barbaresco. Wines produced from this grape have an immense potential for aging. Sangiovese, known as Brunello, is the mainstay of all Tuscan DOC red wines (Chianti, Montalcino, Montepulciano and more), and is one of Italy’s most widely planted vines. The principle variety used in Chianti, Sangiovese can produce fine, smooth, fruity red wines with an aging range from one to 25 years.